When most people think of Bangkok, they think of the endless food and shopping that they’ll be doing. 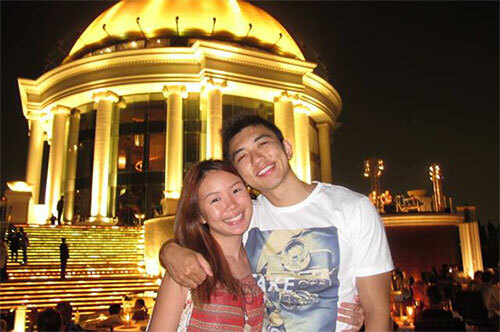 While fun, shopping and eating aren’t exactly the sexiest of activities (unless you are major foodies like our Singapore food blog) to bring your soulmate to. Imagine finally getting your eye candy to go on a trip with you and she spends the entire time shopping, and you, her porter boy. But what’s known to many is that Bangkok can be a romantic getaway too. Kept relatively secret, there’s this extremely romantic rooftop bar in Bangkok that on a clear day, overlooks the entire cityscape under a blanket of stars. Bangkok’s Lebua at State Tower is a scene out of the movies and we meant that literally. It was featured in the widely popular, Hangover Part 2, when the “wolfpack” got together on the rooftop to discuss where they could have misplaced their friend. After the release of the movie, Lebua at state tower became extremely popular with the locals as a date spot, but still remained relatively unknown to tourist and visitors. 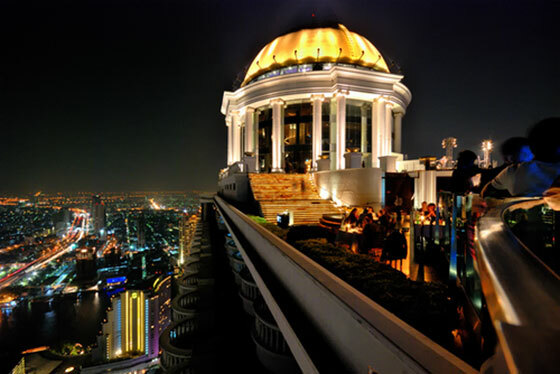 Lebua’s 63rd storey rooftop area is splitted into several sections that divide up the many restaurants and bar areas. From celebrity chefs to romantic outdoor bars, you can find them all under one Dome at Lebua. If you are looking to bring your partner for a romantic date night out, bring him/her to the Mezzaluna restaurant. Mezzaluna restaurant is an indoor restaurant located on the 65th storey that offers fine dining options by Famous Chef, Ryuki Kwasaki. Mezzaluna is the highest restaurant in all of Bangkok and aside from it’s spectacular views, offers seasonal innovative dishes made of exclusive ingredients that is promised to intrigue your tastebuds. Dress up, dine or even propose at this classy restaurant for a date he/she wont soon forget. If you prefer an outdoor setting and be able to experience the wind in your face, opt for Scirocco instead. Located on the 63rd floor, Scirocco offers outdoor dining options by Chef de Cuisine Chef Gonzalo Ruiz who has starred in many hotels and restaurants across Asia. While taking nothing away from the food, it’s the ambience and setting of Scirocco that really takes the limelight. Dine under the blanket of stars whilst being serenaded by their jazzy live band, all of which which spells romantic. *PS Remember to make prior reservations before heading over as they only offer exclusive seatings with the first seating at 6.30pm, and the second at 8.30pm. For a more casual setting or rainy day option, you can choose to head to Distil Bar instead. Distil Bar is their indoor bar section that still remains the classiness of Lebua, but offers diners the option to just have drinks there instead of a full meal. If like us, you are on a tight budget but still want to experience the windy night sky at the top, go to the Sky bar. The Sky bar is located right beside Scirocco and offers the same night sky, outdoor ambience and Live Jazz music that Scirocco does. The only difference is that this section is catered more towards getting a bar type concept. Walk out to their suspended precipice which offers you a 360 degree view from 820 feet in the air. While there, don’t forget to also order a Hangovertini, which was specially created for the hang over crew who shot there. If you are planning to head to Lebua during your trip to Bangkok, be sure to pack some additional shirts, long pants and shoes aside from the singlets and slippers that you will be wearing to Chatuchak. Lebua has strict dress codes and would refuse entry to any non complying patrons. Aside from singlets and slippers, they also do not allow athletic or sports uniform. However, if you are already in Bangkok, perhaps you can try to purchase some at Chatuchak before heading over.